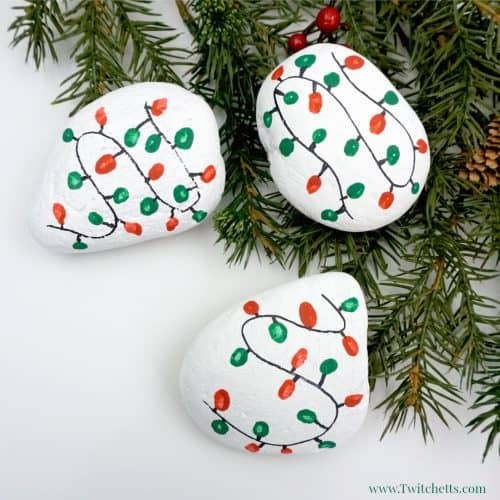 This Christmas lights rock art is easy, fun, and a perfect painted rock to give as a gift or hide in your nearest park. With all of the beautiful rocks being posted all over the internet it is no wonder our kiddos want to make masterpieces of their own! This is why we will continue to bring your fun ideas for rock painting with kids in mind. 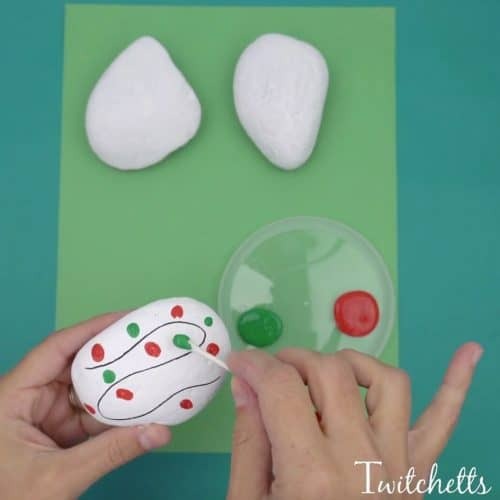 These rocks make a great holiday craft for kids of all ages! 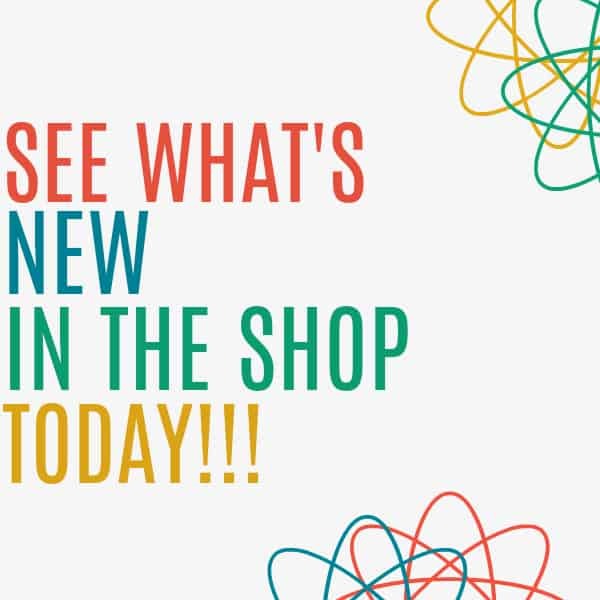 Disclosure: Some of the links in this post are “affiliate links.” This means if you click on the link and purchase an item, we will receive an affiliate commission. Thank you for supporting Twitchetts! Paint. White and any colors for lights. 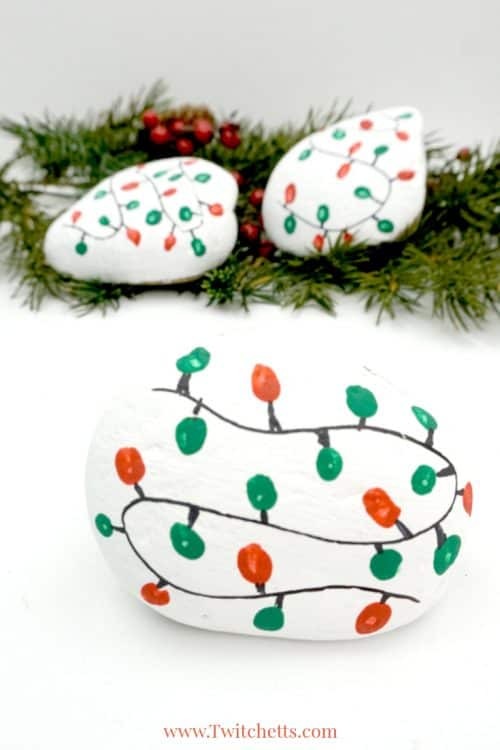 Here are step by step instructions to make Christmas lights rock art. You can see it all in action in the video below. Always make sure to wash and dry your rocks. 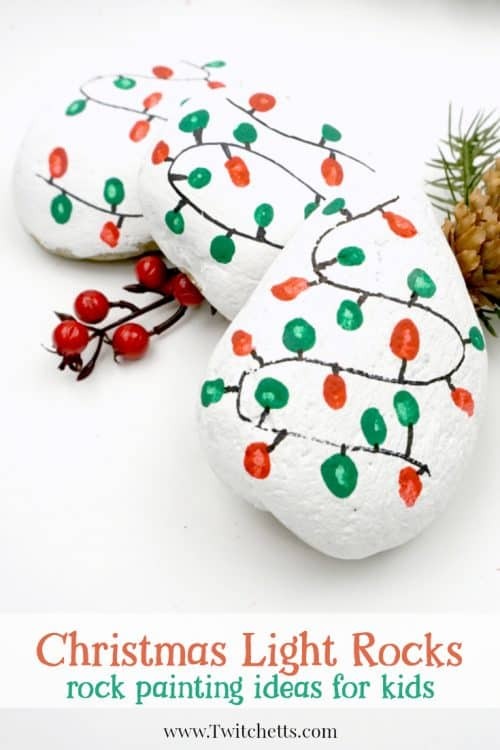 For these Christmas rocks, we started with a base coat of white. This way the lights pop a bit more on the rock. 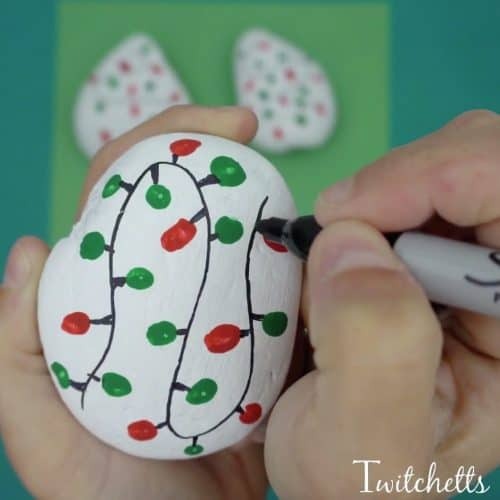 Once the rocks are dry, use the Sharpie to create a string for the lights. They can go any direction you like! Using the cotton swab dab the lights along the line. First, we added red, then green! Make sure they are a little bit away from the line. 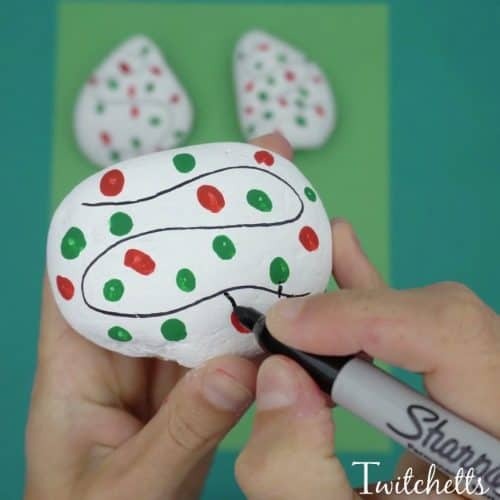 Related Project: Create one of a kind Christmas rocks with this fun technique! 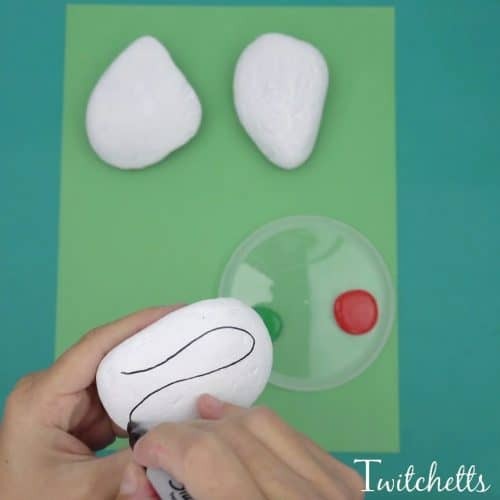 Once the lights are dry, go back in with the Sharpie to attach the bulbs to the string. The bulbs can be on both sides of the string. 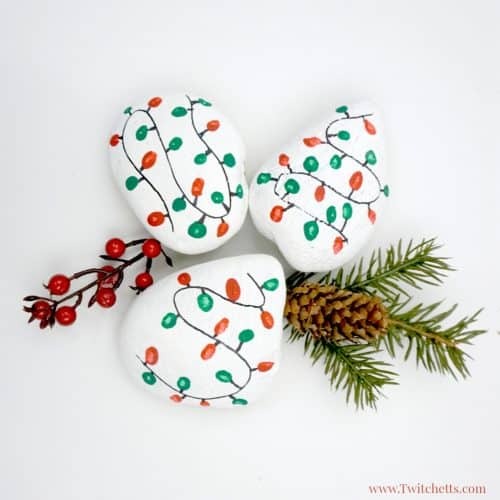 TIP when using a permanent marker on rocks you have to seal them with Mod Podge before spraying with a sealer. Otherwise, the marker will run. 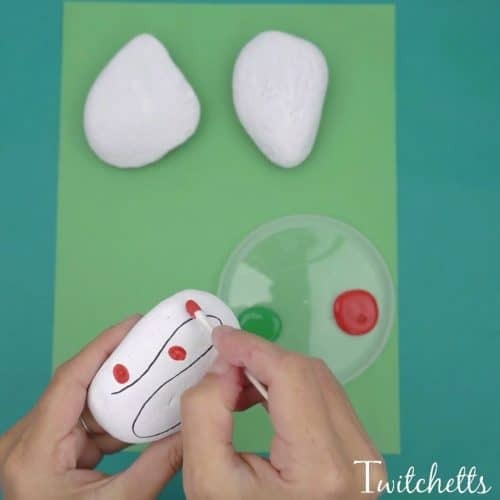 Watch the video to see this easy rock painting process (or show the little ones) before you get started! The kids can pass them out as gifts, hide them in parks, or even use them as decoration around the house! Please pin this Christmas Craft to your favorite Pinterest board.